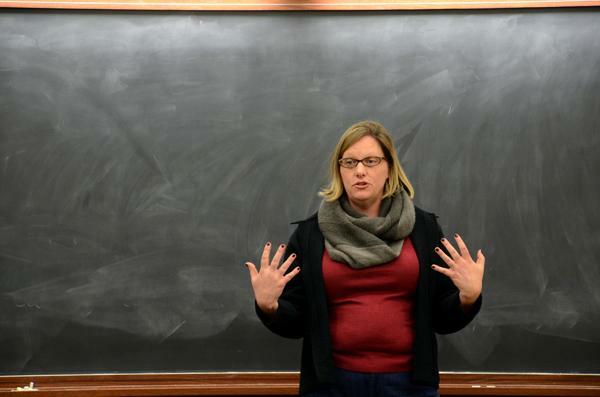 Sociology Prof. Laura Beth Nielsen, the director of legal studies, speaks Monday evening at an open forum on Title IX in Harris Hall. Nielsen talked about ways to address sexual harassment and procedures for making Northwestern’s campus safer. Members of the Northwestern community gathered Monday night to discuss the University’s response to campus sexual violence and lay out next steps to protest NU’s continued employment of philosophy Prof. Peter Ludlow. Nearly 70 people attended the meeting, which came three weeks after a Medill junior filed a lawsuit against the University alleging it had violated Title IX of the Education Amendments of 1972 in its response to her allegations that Ludlow sexually assaulted her in February 2012. The group planned a demonstration where interested students will sit in and then walk out of Ludlow’s 12:30 p.m. philosophy class Tuesday. Weinberg junior Laura Whittenburg organized the meeting, which was held in Harris Hall. Attendees discussed details of the lawsuit, expressed concern at the University’s Feb. 21 response and formed a plan of action that included Tuesday’s sit-in. Whittenburg opened the meeting by asking for a show of hands of who had read the response. More than 20 students signed up to organize six forms of protest, including a demonstration at next week’s Board of Trustees meeting, an email campaign to University administrators and social media action. Students and faculty discussed ways to garner more details on the committee named in both the lawsuit and the University’s response that reviewed the sanctions the Weinberg dean’s office imposed against Ludlow. Consequences included the rescinding of Ludlow’s endowed professorship and prohibiting him from receiving a raise during the 2012-13 academic year. Ludlow, through his attorney, has denied all allegations of sexual assault or harassment. During the discussion, attendees named greater University transparency, stronger policies against sexual assault and Ludlow’s removal from campus as potential goals for their efforts. Ludlow is registered to teach a class Spring Quarter called “Minds and Machines.” The class capacity is 48 students, with 13 registered as of Monday night. Philosophy graduate student Chelsea Egbert told the room Ludlow’s position in the philosophy department puts teaching assistants in “a very uncomfortable position.” TAs do not necessarily have a say in the classes to which they are assigned, she said. A Facebook page posted shortly after the meeting ended Monday advertized the “Sit-in Walk-out.” Monday’s meeting was held in Harris L07, the same location as Ludlow’s class during the planned demonstration. Students who organized the sit-in reiterated the demands presented in a Feb. 23 petition NU faculty wrote to the Board of Trustees, asking the board to implement policies requiring transparency and accountability when addressing instances of sexual misconduct. Sociology Prof. Laura Beth Nielsen, the director of legal studies, helped draft the petition and also spoke at the meeting Monday, giving students background on Title IX and the Clery Act, as well as sharing why the lawsuit had made her upset.